These three principles make it possible– easy, even– for you to participate in the event, hold your own local Sprint, and make meaningful contributions to Sprint projects. Attending an open event and working on an open project is a bit different from your usual event or volunteer experience. Here’s a short video on participation on open projects from Abby Cabunoc Mayes, Developer Engagement Manager at Mozilla, from our course Open Leadership 101. Choose a project: Decide what you’re most excited about. What do you want work on, or learn? Look for a project that can give you that experience. Do your research: Take some time to get to know the project and people and understand their goals. Look for an “About” page on the project web site or the project’s README file on a collaboration platform like GitHub. Dive in! : Most projects have little chunks of work set aside for newcomers. For your first contribution start small, and ask lots of questions. Listen to feedback: Your work will probably be reviewed by someone else in the community– this is a good thing! Use this time to sharpen your skills while helping the project produce quality work. Be respectful and honest: Participation is about working together in a community. Be respectful of the ideas and perspective of others. And be honest with your new collaborators– be realistic about what you have the time, energy and skills to do. If you’d like to know more about collaboration for the open web, we recommend taking our 1-hour online course, Open Leadership 101. The Global Sprint is a great opportunity to experiment with online collaboration tools and techniques. 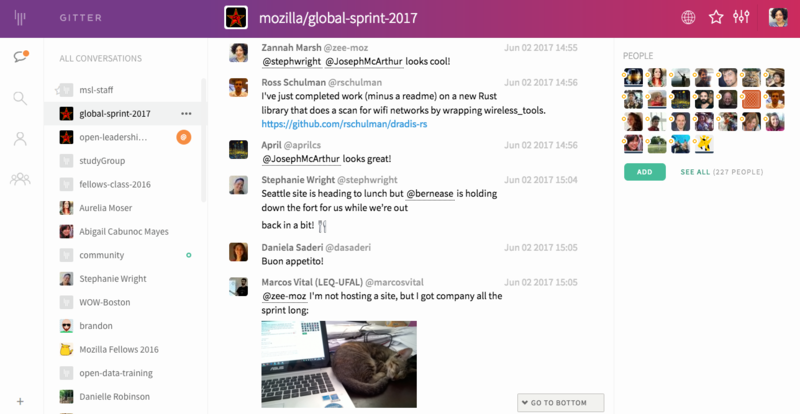 These are the tried and true tools we use to work together at the Global Sprint– tools that Mozilla staff use in our day-to-day work. GitHub is an online platform for collaborative work. At the Sprint, participants and project leads use GitHub to share and discuss project plans and materials, assign work, and make changes to code or content. 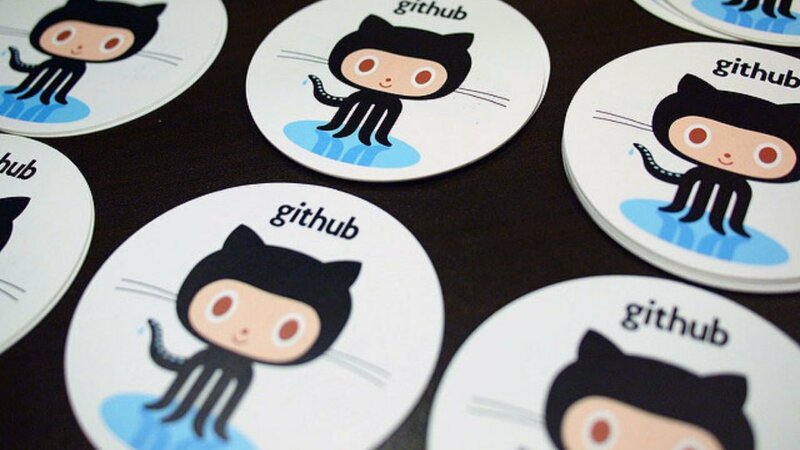 Software projects may use GitHub’s full functionality to accept code changes, while projects that aren’t code-heavy may use GitHub simply to list, discuss and assign tasks. Project work can happen elsewhere– in word processing or design apps, in code editors, or on regular old paper. You don’t need to be an expert in GitHub to participate or lead a project at the Sprint. 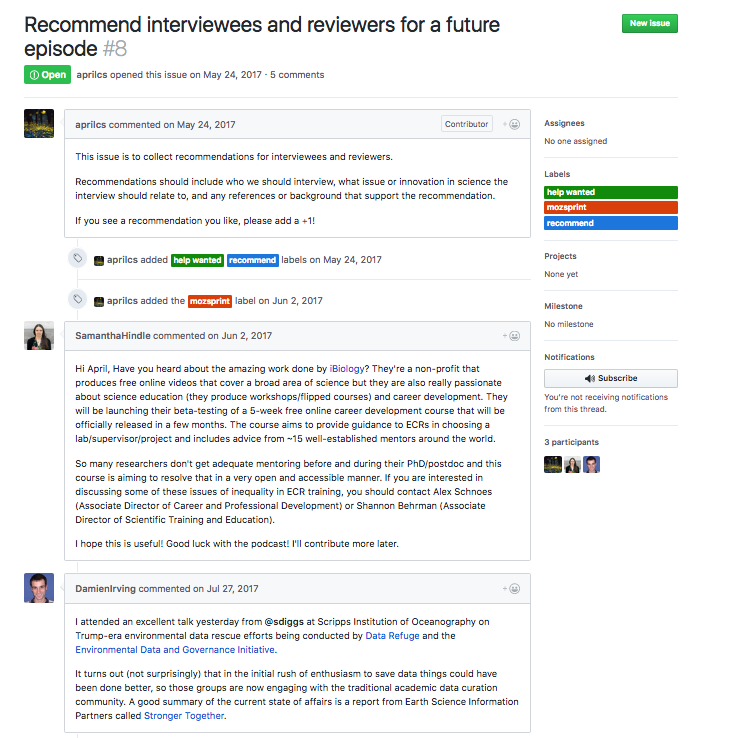 If you’ve written a blog post or posted a comment online, used an online forum, clicked around a website to find information, or used tags to search for content on a site, many of GitHub’s basic collaboration features will be familiar. To prepare for the Sprint, project leads use GitHub to set up a collection of project files (called a repository), create project documentation in the repository, and create “issues” or chunks of work that participants can help with. Our Project Lead Guide includes GitHub tutorials, tips, and templates. Participants use GitHub learn about projects, see what tasks they might take on, and discuss and share work. See the Participant Guide for tutorials and tips. Etherpad is a web-based text editor for note-taking and collaboration. One way we use etherpad is during our video calls, to keep track of the schedule, and share notes and comments on project updates. We also use this tool for group brainstorming, or to draft collaborative documents. 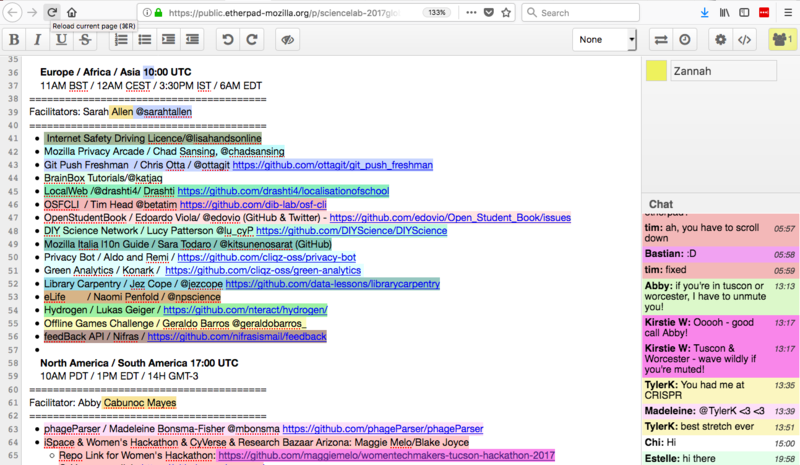 Participants add their name and pick a color at top right– when they type text or comments in the main pad window or the chat window at right, anything they type will be marked with their signature color. At the Global Sprint, feel free to jump into our shared etherpad conversations and add comments/notes wherever you want, or ask questions of other participants. You can also add a +1 next to someone else’s comment to show that you “like” it. You don’t need to sign in to use Etherpad– just type in your name at right and start commenting! Gitter Chat is an application for chatting online. You can join the Global Sprint channel here, signing in with a GitHub account or Twitter ID. In the run-up to the sprint, you can ask all your site, project, and participant questions in this channel. Pop in and introduce yourself– you can use it to chat with others about your plans for the sprint, and get advice from veteran sprinters. During the sprint, we use Gitter Chat for site and project updates, comments, questions, requests for help on issues, and of course to share Sprint-related cat photos!